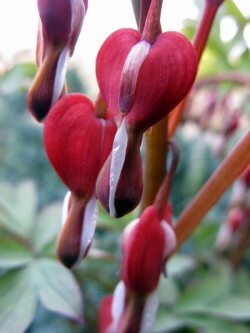 Dicentra spectabilis Valentine ® USPP22739 – the compact true red game changer Pride of Place Plants Inc.
Plants: Valentine® is a new unique selection of dicentra spectabilis with rich racemes of true red , dangling puffed heart shaped flowers, set prolifically on dark red stems, shown on a much more compact plant. Further shown off by distinctively cut, lobed foliage of green to gray/purple in color. The abundance of flowers are self cleaning. These vibrant colored racemes of red flowers make delightful additions to fresh bouquets, lasting about 2 weeks. This exciting new discovery was found as a chance seedling in the garden of the parent variety, in Prince George, British Columbia Canada, it was isolated and tested true to type through trials since 2005. Foliage: green to mature foliage tinged with grayed- purple . Care: Very tolerable to cold climates. This perennial is easy to grow, suitable for outdoor landscape and container use. Position in shade or part shade, keep sufficiently moist in nice composted soil for best results. An old fashioned favorite with a much more vibrant look! After flowering, the plants should be sheared back to 15cm o rejuvenate the foliage. Deer Resistant. Attracts hummingbirds. Good companion plants are Pulmonaria, Brunnera and Hellebores, Heuchera, Ferns and Hostas.